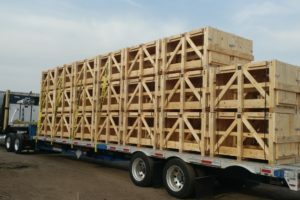 Mil-Spec Packaging of Georgia manufactures custom corrugated and wooden containers on-site at our manufacturing facility. No order is too large or too small. We are able to manufacture boxes and crates with inserts, foam, etc. to meet your packaging needs in order to keep your items safe in shipment. We also carry bags, barrier material, and other packaging materials. We offer contract and military spec packaging, export packaging and containerization. We are a full-service packaging company that understands the military specifications. We can provide you with corrugated boxes, fast packs, wooden crates, bags, barrier material, polyurethane and polyethylene foams, bubble wrap to the commercial and military specs. Small quantities or large quantities are no problem. No minimum order size. We also can package your items for you if needed as well as design packaging for your specific parts.